French doors create a grandiose sense of luxury in any home. Their lavish styling is complimented by their practicality, with a variety of options available to suit any application and desire. Our French doors are available in Aluminium from Southern Star Aluminium Windows and Doors, and Timber from Canterbury Timber Windows and Doors. 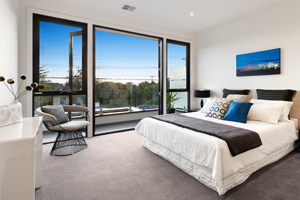 Our Southern Star Aluminium French doors are a great option if interior wall space is limited. We offer a wide range of inspired design options in our 100, 200 and 300 Series styles. Offering contemporary styling, our French doors are an elegant and practical way to open up your living area and allow wide access to a courtyard, garden or patio. French doors offer a unique and functional feature in your home that is show to make a bold statement and talking point, while creating the lifestyle you want for your home. Available as both an open in or open out application, our French doors have the ability to be a stunning 2400mm high. Our full range of aluminium powder coat colours is available. The popular design of Canterbury's timber French door is stylish and practical and can be supplied in open in or open out configuration to meet your specific requirements. 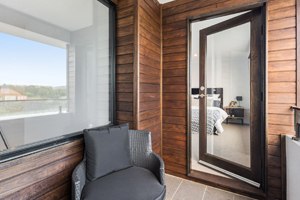 Canterbury French doors are available with options such as solid timber panels, large glass expanses or a variety of colonial bar configurations. Timber French doors can be fitted with standard, toughened or laminated glass and can be double-glazed. There are also optional solid timber panes available. Timber material choice between Meranti, Western Red Cedar, KD Hardwood that can all be stained and painted as desired. Our timber French doors can be coated with TimGuard – our exclusive semi-finished two coat clear seal, for improved protection and longevity. Full locking options are available for security, safety and piece of mind. 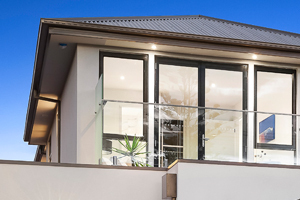 The Carina Lever comes as standard on the 100 and 200 Series aluminium French Doors, while the 300 Series is provided with Commercial Wide Stile lever. Visit a showroom, our website or contact us today to learn more about our range of French doors.